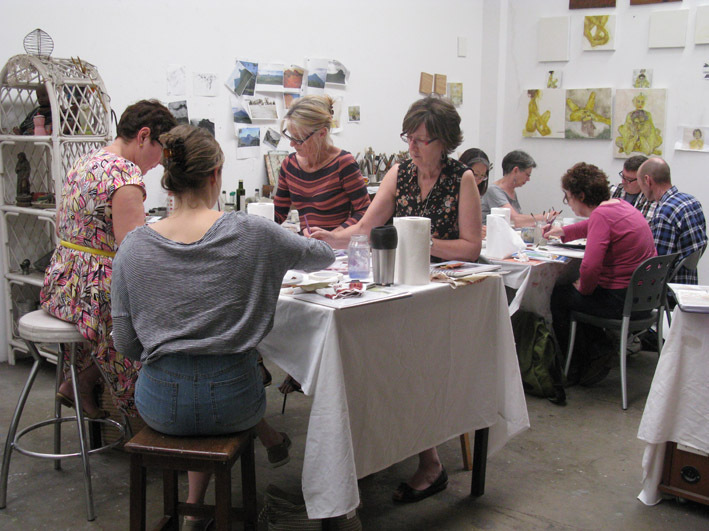 Last Sunday, 1 November 2015, I taught my 1-day watercolour workshop, ‘Simply Watercolour’ which was held in the Scratch Art Space premises at 67 Sydenham Road, Marrickville NSW. 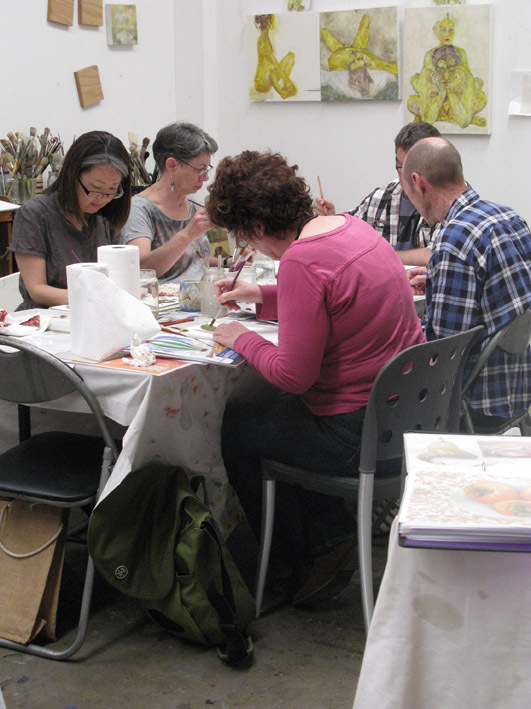 This workshop was designed for absolute beginners with no watercolour painting or drawing experience and for those students who have worked with acrylics or oils and were interested in trying this versatile medium. I had a lovely group of 9 enthusiastic students with various levels of painting and drawing experience attending the workshop and by the end of the day I think most of them felt they had really got something out of the class which was very gratifying. Using a limited palette of just 5 colours (Ultramarine Blue, Quinacridone Magenta, Quinacridone Gold, Raw Sienna and Burnt Sienna) students were shown how to work quickly in a loose style that required only a minimum amount of drawing – a simple method that can be applied to virtually any subject ranging from still life to visual travel diaries. 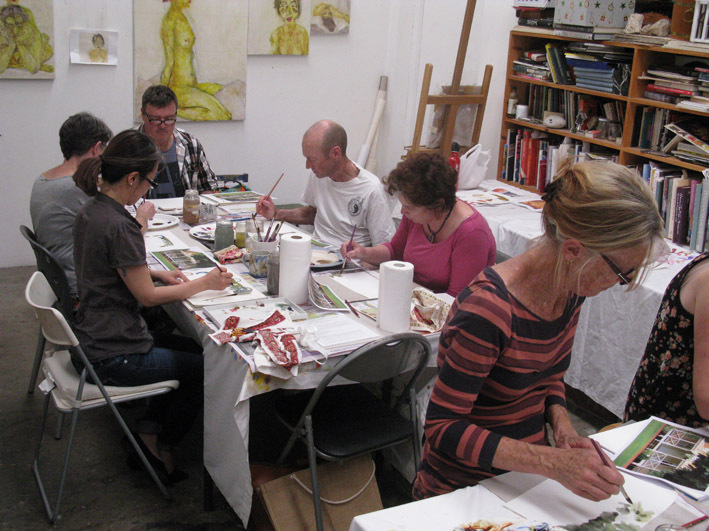 Students were shown the basic techniques for painting with watercolours commencing with some simple exercises to get the feel of the medium and the limited palette. Then they were given a tray of variously coloured gum leaves, and sea shells in more subdued colours, and asked to choose 3 of each to simply draw and paint as an exercise in creating quite strong vibrant colours through to very subtle shades using just the 5 colours on their palette. This was followed by an exercise where all students were given a copy of the same scene and shown the alternative styles of quickly putting down the colour first then drawing the pencil linework over the top, and the alternative method of making a quick drawing first and then adding the colour. The last 2 exercises of the day involved drawing and painting some pieces of fruit and finally, drawing and painting a vase of fresh flowers. In all cases it was very interesting to see how different students approached the same subjects and the final results they achieved. I am looking into teaching further workshops in the future with the venue and dates yet to be decided. A few of the students last Sunday expressed interest in doing a ‘Travel Sketching/Diary’ workshop so this could possibly be the topic of my next class.